Polished travertine tiles have a beautiful shine that reflects light around the room. It’s easy to care for, durable and luxurious. An exotic choice for any Miami home, it’s being used in upscale homes and businesses around the country for flooring and wall coverings. Here are a few of the ways you can use travertine in your design or contracting business, as well as the benefits of ordering from the top wholesale supplier in Miami. Travertine is a beautiful choice for any project. It’s been in use for thousands of years, and it has withstood the test of time. It is an upscale option with a slightly higher price tag, but there are many benefits to choosing travertine. When you present your design plan to your customers, make sure to inform them of the wonderful benefits. They will be more confident in your abilities, and they will become excited to have this beautiful material in their home or business. Travertine has been used in Italy and Greece for thousands of years. It’s a sophisticated choice that brings a luxurious feel to any room. A durable choice, travertine may not ever have to be replaced. Rather than choosing flooring that will wear down and have to be refinished or replaced, stress to your customers the durability of travertine and the fact that they it may last as long as their home or business. Available in a range of colors, travertine can be found in ivory, beige and even stunning shades of gold. People want their homes to stand out, and travertine ensures that your customer’s home will be set apart from the neighbor’s. Travertine should be sealed annually to avoid staining, but it is otherwise very easy to care for. There are also key benefits that you will enjoy as a contractor or designer. Featuring neutral colors, travertine will work with any décor from rustic to contemporary. This makes it easy for you to feature travertine in the flooring or even the bathroom walls while adding bolder accessories and design features in other areas. The stones are also easy to work with, and that means that they are faster to install. Travertine is a hard, durable stone, yet it’s easy to cut and work with. While you may spend hours trying to cut other natural stones and go through frustration of broken tiles, travertine is much easier to work with. Your projects will go faster, and that allows you to increase overall project levels. Your customers will also appreciate the savings as you pass lower labor expenses on to them.The tiles are durable, and they are not prone to breaking. However, they are most secure once they are installed on a wall or floor. Avoid the frustration of broken tiles by working with an experienced wholesaler. Stonexchange ships all tiles in crates and containers with proper wrapping and protection to ensure that they arrive as intact as possible. While a few tiles may still break during the shipping process, most of them will arrive intact and in good condition. This also helps you increase profit margins as your team will spend less time searching through a shipment for whole pieces. When you are offering upscale services like additions and stunning interior design, you need to invest in upscale materials that your target customers will appreciate. When you present a plan featuring polished travertine, your clients will appreciate that you understand their desires and want to provide them with a stunning home interior or business design. Travertine tiles are just one of the upscale materials you should embrace that will help you set the right tone and attract the right clientele. 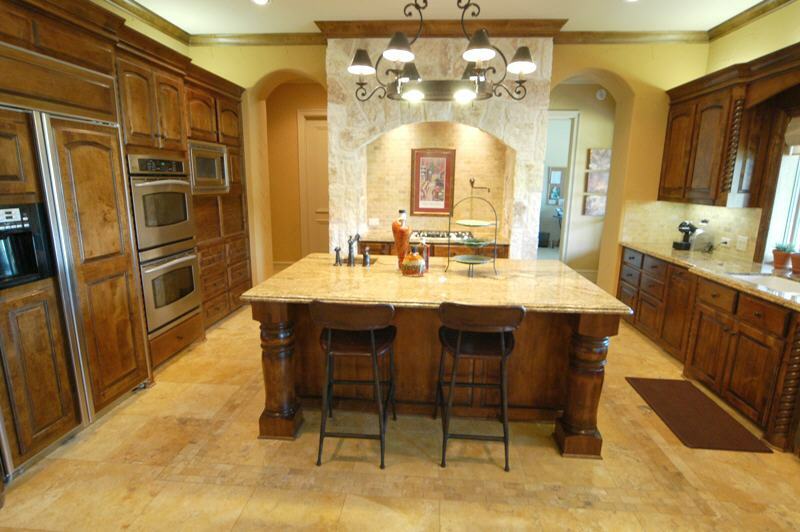 Travertine is a beautiful and durable stone that can be used in a variety of ways. When planning an outdoor living space for commercial or residential purposes, consider adding travertine to the design plan. Smooth travertine is a beautiful choice for outdoor counters, benches and more. Inside the home, travertine is useful as floors, fireplace covers, shower walls and more. Installed on a kitchen backsplash or in the mudroom, it helps keep the home fresh and clean. It’s also the best choice for those little details like windowsills and thresholds. An upscale building material, it’s a stunning choice when your customer wants a sophisticated look that takes their home or business to the next level. Stonexchange specializes in travertine windowsills and thresholds. However, we also offer travertine in other styles that will suit all of your construction and design needs. Visit us for pavers, tiles, slabs and mosaics. We carry pool copings, soap shelves, shower curbs, seat and even caddies. We specialize in natural stones and order massive quantities to keep the prices low, and we pass those savings on to our customers. Whether you are working on an interior or exterior project, we have the travertine tiles and sills that you need to create a luxurious look that is durable and visually stunning. If you have specific sizes that you want to order, we are happy to assist you. All custom orders must meet minimum order requirements, and it can take two to three months to receive your custom order. However, this is still a substantial savings because we help you save by ordering in bulk. Whether you need thresholds that are a little longer or you are looking for specific tile sizes, we can assist you. Our custom orders also feature attractive pricing that helps you keep costs down and your customers happy. We have developed a solid relationship with overseas factories, and they provide us with incredible low prices as a result of those relationships. We have extremely fair container prices that are competitive with buying direct from overseas factories. Whether you are a retailer offering travertine windowsills or a designer trying to develop a stock for future jobs, we can provide you with the most reasonable prices to help you save money and increase your profit levels. Trying to buy direct from overseas factories can be complicated for businesses who are unfamiliar with the process. The paperwork alone can become a deterrent. However, you can enjoy smooth service when you trust your order to Stonexchange. We carry most items in stock, and we ship out orders the day they are received or the very next day. You can have your order in your home or at the job site in a very short time. We have spent years buying massive bulk orders and developing our relationships with overseas manufacturers. In fact, our prices are usually more affordable than the direct order prices these manufacturers offer new customers. Miami contractors, designers and retailers know that Stonexchange has the best prices and service, and people around the country are thrilled to discover that they can benefit from our low prices, quality stones and excellent customer service. While we do not work directly with homeowners, we do offer nationwide shipping on our crates and containers of natural stone products. Whether you are working on a retail center in St. Louis or building upscale homes in Hollywood, you can also take advantage of our low prices and stunning stone tiles. Custom orders take two to three months to receive from our manufacturers overseas, but other orders are shipped the same day or the next day. We have contracts with the top ground shipping companies in the nation, and they will have your product to you as quickly as possible. In addition to offering shipments that are fast and accurate, we also offer reasonable prices on all shipments. We have spent years developing relationships with our shippers and negotiating fair prices, and we pass those savings on to you.When you are adding natural stones like travertine to a project, you need to work with a supplier you can count on. Stonexchange specializes in natural stones like marble, granite and travertine. We carry an extensive selection of tiles, sills and other materials to help you with all of your renovation and design projects. Whether you are ordering custom pieces for a project or ordering standard sizes ahead of time to have them on hand, we can assist you with all of your travertine tile needs.When you cater to an exclusive clientele, you need to offer exclusive materials that aren’t found in every home. Travertine stands out from other materials and is one of the most sought-after building materials for home interiors and even patios. Choose a wholesaler that will provide you with fast shipping, excellent customer service and the most reasonable prices. With our help, you can lower business expenses and increase the profit levels on your jobs. More importantly, your customers will be thrilled with the addition of natural travertine to their homes or businesses, and they will be thrilled with the finished look of your project.